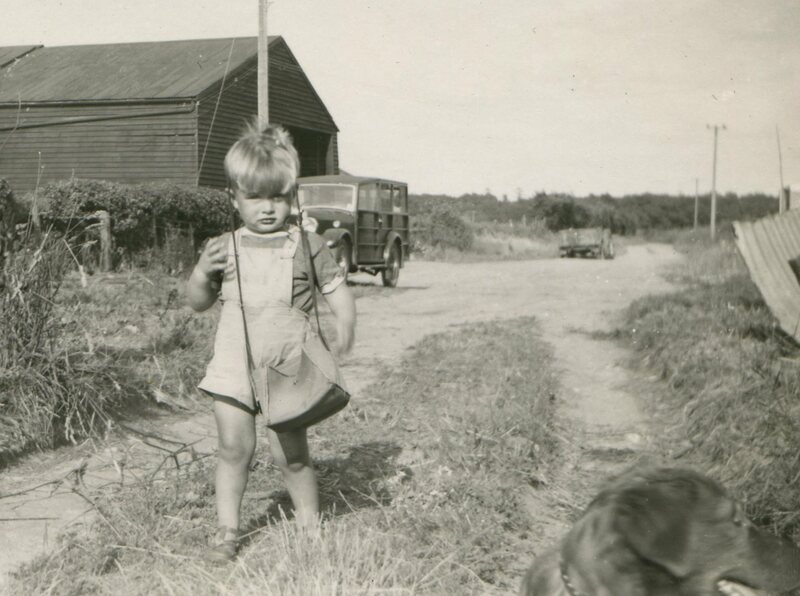 Continuing my journey back to the images of childhood, before setting out for six months on the road at 62, I can’t resist posting a couple of evocative pictures from the very early years, at Duckshole Farm near Holt in North Norfolk – causing my brother Hugh early grief, but already displaying the instincts of the traveller. Looking at these pictures for the very first time 60 years on does make me reflect on how memory is constructed. But now that I’m seeing the images as others will have seen them at the time, how much of the story that I now reconstruct every time I recall those memories is my own authentic recollection, and how much rebuilt in retrospect? As a psychotherapist, I now work all the time with memory, travelling with clients as they explore their own past and seeking to make sense of how they learned to be in the world – emotionally, physically, consciously and less so. Sometimes, neither of us knows whether what is remembered in the session is actually what happened, or a reflection of how the brain tells the story back to itself all these years later. The story is always entirely authentic from a subjective and emotional point of view, drawing deeply on the client’s truth. But in objective, external terms? Often. Sometimes. But always to be taken seriously and respected. While I remember my own solo walk down the lane, I don’t of course remember the ancient shooting brake car in the background. 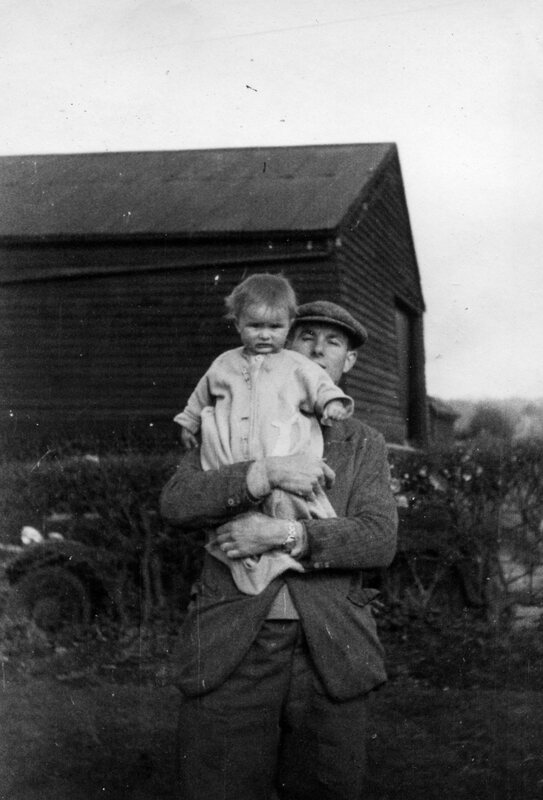 Nor, interestingly, do I remember ever being held by my father. Clearly, as evidenced on the left, I was. At least once. But what I do also remember is the continuing close bond with and affection towards my brother Hugh, 18 months younger than me and also now beyond 60 – a closeness that led him in due course to identify what he cheerfully termed my affliction with Big-Brotheritis. 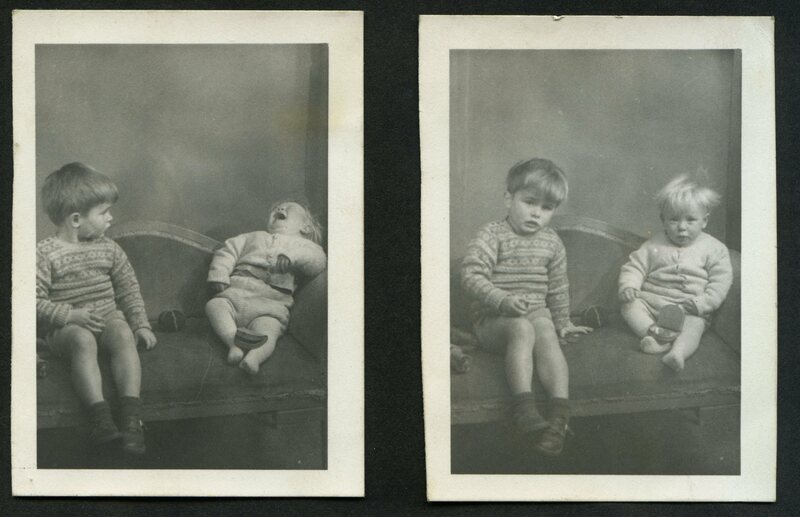 Discovering this pair of pix from, I guess, summer 1952, I sense he may have a point. Although then, as now, we clearly quickly made up again. I believe I’ve contacted you a while ago, re I was born at and also lived at Duckshole Farm, Holt. I think it was in response to a photo of you on a bicycle outside the door of the house, the photo was taken where a photo of me was taken on my tricycle. We moved out of the farm in 1963, following an accident when my father injured his back, and could no longer work on the farm. I loved living at Duckshole Farm, and have very happy memories. It’s a bit sad to see what they’ve done to it now, not least to realise the house, barns and cart sheds are no more. It was great being a ‘railway child’ long before I ever heard of or saw the film. Running down the fields, watching a steam train go by, waving to the people, then running back up the farm track again. Sadly I have very few photos of the farm, so loved seeing your photo of the drive and track down to the fields. How delightful to hear from you Muriel. Do you still live in Norfolk? My wife and I – as you may have seen from the blog – moved back to Sheringham a few years ago, and while I continue to work in London, North Norfolk is home again. And Duckshole is a big sandy hole in the ground. If you drop me a direct email, perhaps, I can send you a link to more photos of the farm in the 50s, and to how it looks today – I’ve been back a couple of times and snooped around. That would be wonderful, and thank you. So do I e-mail you at Braynework? I do have a plan of the farm, and if you’re interested, I could e-mail a copy over to you – once we are in e-mail communication of course. I’ll dig out the photos I do have, and can e-mail copies of those too; though, as I mentioned, there are not many, and mostly they are of the family. To think my dad sold the farm as agricultural, and it’s been excavated ever since – almost 56 years! Reckon if he’d known it was going to be pulled down, dug up like that he would have thought twice about selling it at the time. He also loved the old place.